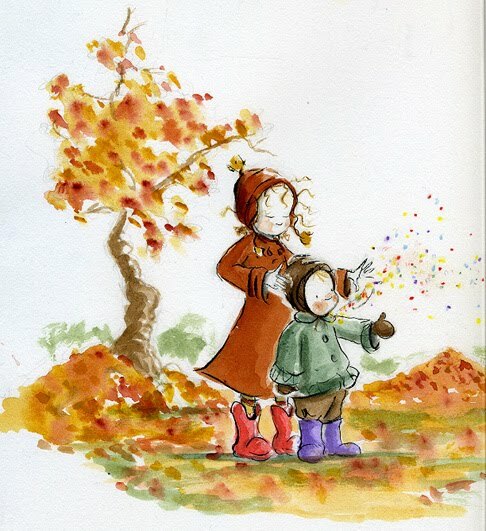 Flora’s Very Windy Day by Jeanne Birdsall. Illustrated by Matt Phelan. Clarion Books, 2010. Currently available. Face Value: Captivating! Phelan’s gorgeous artwork is so graceful and animated. There is a terrific sense of movement in this cover image, whisking Flora and Crispin off into the sky for their windy day adventure. I love Flora’s half-smile – it is almost a smirk, and it conveys her sense of agreeable willingness to experience whatever adventure ensues. Does it break the slate? It does! 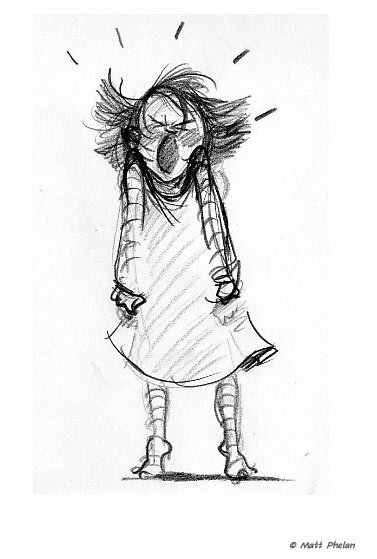 Flora is a determined little girl, and she is tired of dealing with her irritating little brother. She is clever enough to cook up a scheme that will get rid of him for good. However, in a crucial moment, Flora decides to save the day. She actually has to stand up to forces of nature (not exaggerating) to remedy the situation, but she does it and she does it well. It’s tough to be a good big sister, and Flora models that role in a Slatebreaking way. Who would we give it to? Girls who have younger siblings that occasionally drive them up the wall! I am a big sister, and there were times when my sister made me feel crazy. (No offense to my sister Alanna, if you’re reading this. It was when you were very little. But sometimes you bit me, and once you threw my favorite shoes in the trash and covered them with applesauce.) Flora’s Very Windy Day models “sibling tolerance” in a unique way. This would also be a great seasonal book to read with preschool or kindergarten-aged children in the fall, because the pictures of orangey-red leaves and the fall clothing of the characters give it an autumnal feel. Review: I must confess that I was predisposed to love this picture book. Jeanne Birdsall is the author of the entirely wonderful Penderwicks series (read more about the Slatebreaking Penderwicks here), and Matt Phelan illustrated the Lucky books by Susan Patron, as well as the excellent The Storm in the Barn. When I saw that these two had teamed up to do a picture book, I knew that it would steal my heart. Flora’s Very Windy Day is a gorgeous book. The words, the pictures, the story – it is all so beautifully crafted. I recently read this book to a classroom of 3-year-olds. When I paused to turn the page, I surveyed this normally squirmy and distracted group and saw them gazing rapt at the book. I continued the story and they crawled over one another to get closer to the pages. At the end of our story drama lesson, they begged me to leave the book in their classroom so that they could read it again. This book has an amazing impact on child and adult readers. Because I am a teaching artist, I am always looking for books that can easily be dramatized in the classroom, and this book lends itself to dramatic exploration. I would recommend this book for any preschool or early elementary teacher looking to expand their classroom library. This is especially true when you are young. Crispin drives Flora nuts while she’s trying to paint, so her mother sends her outside to work off some steam. It is a windy day and Flora puts on her super-special heavy-duty red boots so that she won’t blow away. Equipped for an adventure, she goes outside – but much to her annoyance, Crispin follows, inappropriately dressed for the weather. Crispin is carried off by the wind and Flora is glad to see him go. Then, in a dramatic and well-drawn turning point in the story, Flora kicks off her super-special heavy-duty read boots and flies after him in the wind. She doesn’t understand why she goes after him – it’s just her sisterly instinct kicking in. And then, at the end of the book, we have the sweetest moment, depicted without words. Flora brings Crispin home safely (of course), and their mom gives them chocolate chip cookies. The last page of the book shows Crispin and Flora sharing the cookies while hugging. If chocolate chip cookies and sibling love doesn’t warm your heart, then you are made of stone. Reviewed from copy purchased at Barnes and Noble. This entry was posted in Picture Books, Reviews and tagged Jeanne Birdsall, Matt Phelan, picture book, preschool, Siblings, The Penderwicks, wind. Bookmark the permalink.